The stock market is riding a rally as if it is back in 2017 when stocks almost never fell. As you can see from the chart below, the S&P 500 is on an 8 day winning streak which is the longest streak since October 2017. The market hasn’t been up 9 days in a row since late 2004. Record streak is 14 days. It would be quite something to beat the longest streak in 2017 as that was a very placid year. On Monday, S&P 500 increased 0.1%, Nasdaq increased 0.19%, and Russell 2000 fell 0.22%. S&P 500 is up 15.51% year to date. It increased 19.42% in 2017. Which means this year could easily be better than that one. Personally, I don’t think the rest of the year will go smoothly for stocks even if the economy starts to recover. Winning Streak - VIX increased 2.18% as it is now at 13.18 - That’s still very low. 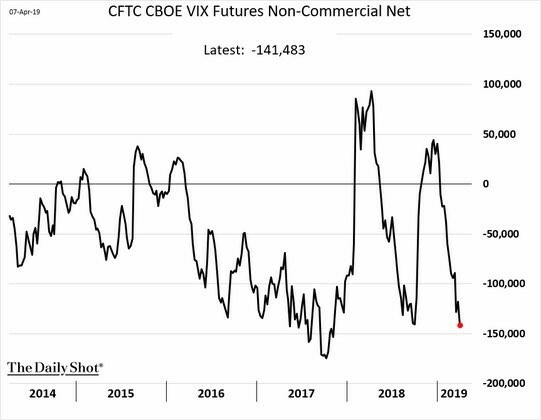 As you can see from the chart below, the non-commercial net futures position for the VIX is extremely short. It’s near the level it was at last fall before the 20% correction/mini bear market. The only good news here is less investors are short the VIX than in late 2017. In early 2018, the short VIX position blew up and stocks tanked. Sometimes fundamentals move stocks and other times sentiment moves them. In this case, everyone going in on one trade can be a disaster. When the tide turns, traders will need to buy the VIX which will cause stocks to crater. Of course, it’s not just the VIX that traders are using to express bullishness. Bullishness can be expressed in numerous different ways. As of February, 57.1% of consumers stated they thought the stock market would increase in the next year which is down from 66.7% in January 2018. Bullishness is relatively elevated, but not close to the record peak in early 2018. This is somewhat similar to the tepid response fund managers gave about equities in March. However, investors are skeptical of most surveys that show any bearishness at this point because stocks have rallied so much. Since February, I bet a lot of consumers have turned towards expecting stocks to rally because they are simply following the trend. They were not saying to buy stocks in early 2009. Even though fund managers are more sophisticated, they have pressure to outperform the S&P 500. This makes them act irrationally. If they were bearish in March, they definitely faced extreme pressure to turn optimistic. The total return of the S&P 500, which includes dividends, is only down 0.1% from its record high in September. Anyone who has been bearish in the past few months soon won’t be able to claim stocks have declined since the fall swoon started. If you’re living in reality, it’s very clear this is a bull market as the bear market ended a few months ago. However, when some traders are wrong, they cling to that wrong position until they get swept away. Once there aren’t clingers left, it’s time to fear a correction. On Monday the best two sectors were consumer staples and energy which were up 0.43% and 0.49%. With its recent 3% run, the energy sector is now outperforming the S&P 500 year to date as it is up 16.13%. The worst 2 sectors were utilities and real estate which fell 0.73% and 0.5%. Those both fell because of declining bond yields. With its recent decline, the utilities sector is now underperforming the S&P 500 decently as it is only up 10.92% year to date. That’s a good sign. A few weeks ago, many were discussing how utilities outperforming the consumer discretionary sector was a terrible sign for the economy. Either the economy was about to go down the tube or the market had it wrong. 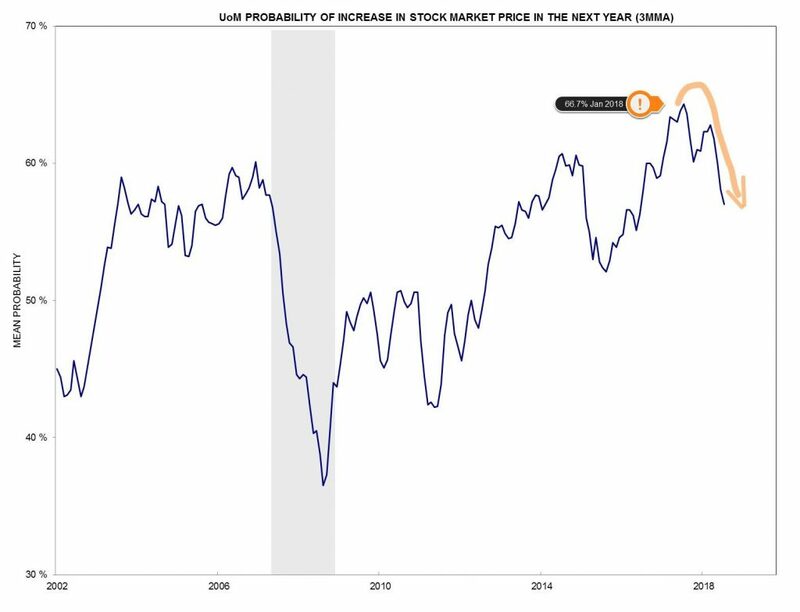 With the great readings from the ECRI leading index, it looks like the stock market had it wrong as the economy should rebound late in 2019. Treasury market had a crescendo top in late March which I think won’t be matched for at least a few months. Yields should rise as the economy recovers. Since this slowdown hasn’t been terrible, it’s safe to say the treasury rally in early 2019 was equally as overblown as the sell off in mid to late 2018. 10 year yield is at 2.52% which is 15 basis points above the bottom in late March. It’s decently above the Fed funds rate finally. 2 year yield is at 2.36% which makes it 5 basis points below the effective Fed funds rate. The difference between the 10 year yield and the 2 year yield is now 16 basis points. I don’t see an inversion occurring soon which was my original prediction. However I do see the economy recovering and I don’t see the Fed hiking rates this year. 2 year yield being below the Fed funds rare implies a cut is coming soon. Since I don’t see a cut coming soon, I think the 2 year yield will increase in the next few weeks. I think somewhere around 2.5% is closer to fair value. Currently, there is a 48.8% chance the Fed will cut rates this year. That’s much lower than where it was when rates bottomed. Jerome Powell is going to be speaking this week at the Democratic House Caucus. I don’t think he will change forward guidance, but I will be following what he states. The next Fed meeting is May 1st. Any expression of caution this year has been dead wrong. However, I think this winning streak in stocks will end soon. The CNN fear and greed index is at 74 which is on the cusp of extreme greed. On the other hand, the S&P 500 only needs to increase 1.17% to hit its September record high, so it probably will levitate higher this month.